Young women today are facing a whole host of challenges. Some of these challenges are the same and some are different than those of the generation before them. From crippling student loan debt to glass ceilings, internships to sexual assault on campus, young women in America today have a lot to figure out and fast. In August, we kicked off State of the Girl, a new content series dedicated to uncovering the biggest challenges facing young women today along with insights on solutions. 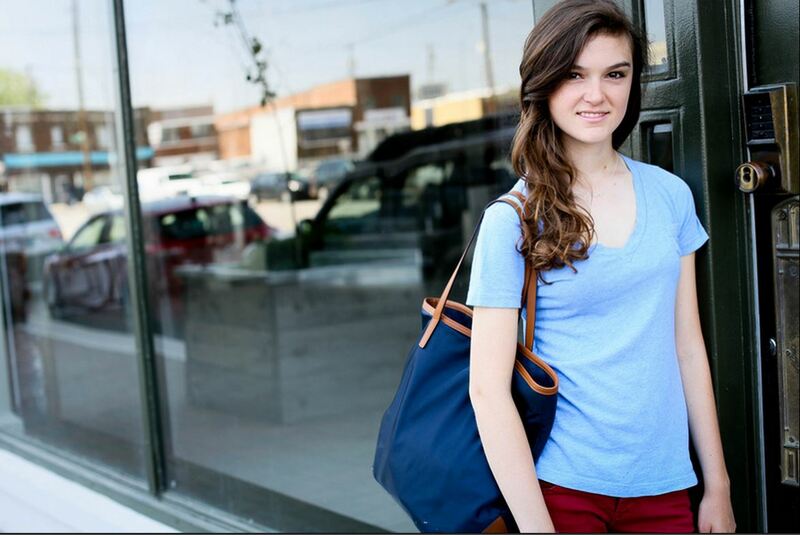 Over the next few weeks, we are taking a look at how young women are being impacted by the burden of student debt. It is no secret that the cost of college has reached an all-time high, with tuition having increased by more than 1,122 percent since 1978! College has gotten so expensive that families are struggling to keep up. Ultimately, many students are taking a step back and reevaluating the value of a college degree, finding themselves asking: Is college still worth it? In a survey we did in partnership with QuickSurveys.com last November, we gained several key insights into the burden of student debt and how it is uniquely impacting women. To start the discussion, it’s important to share that, according to the AAUW, student loan debt is an even bigger crisis for women than men. Why? More women than men have a higher student loan debt burden after college, according to an AAUW study. So it comes as no surprise that our female survey respondents believe that the high cost of education requiring student loans to cover is an impediment to equal opportunity. 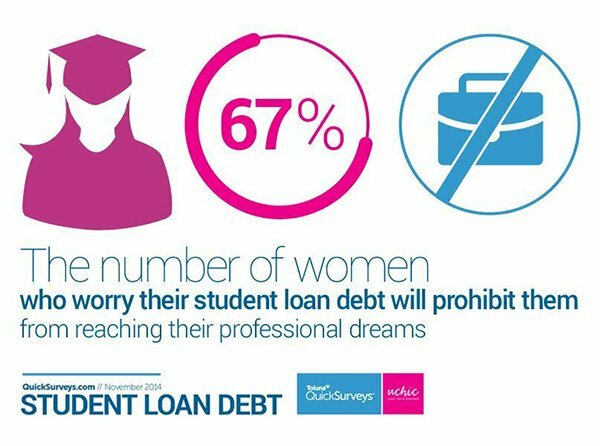 According to the following graphic from our survey, 67 percent of women are concerned that their student debt will prevent them from reaching their professional dreams. While this can all seem like doom and gloom, there are things that students can do to empower themselves to make the best of a not-so-great situation. It’s also on our educational institutions to make changes too. By 2020 65 percent of all jobs in the economy will require a post-secondary education and training beyond high school, so a college education, and the experiences you have during those years, are still of the utmost importance. Additionally, a person with a college education earns twice as much on average as someone without one and that gap is expected to widen in the future. There’s no doubt that college is still the best path to a good paying job. But to get there, women need to take control of their own future. It’s critical to approach their choice of school as they would approach any big purchase decision. You have to do your homework, comparison shop and take the time to really think it through. It’s time to become a smart consumer for your own education. Once you’ve identified some potential schools, take the time to educate yourself on them. Ask the hard questions of the colleges you’re considering, prioritizing universities that provide out-of-classroom, experiential learning hands experiences that can lead to full-time employment after college. Another thing to look for when researching schools? High job placement rates of graduates are another key statistic to research. Look at the specific program you’d like to get into and ask where alumni are now. If nothing else, one good thing to come out of this changing student loan landscape is that colleges are fighting to become more competitive. They’re making a big effort to afford students the best hands-on or experiential work experiences that have proven to lead to fulltime employment after college. Whether built into their curriculum, like Babson College’s focus on experiential learning opportunities for their undergraduates, or through partnerships with organizations like Koru, colleges are making an effort to connect students with real-world work experience that can lead to good paying jobs thereby lessening the burden of student debt. Hopefully more educational institutions will follow suit. While we’re far away from an ideal situation for students to affordably fund their college educations, and ultimately their future professional dreams, there are many things female students can do to make the best of a bad situation. By thinking of your college education as any other large purchase and putting in the hard work before stepping foot on campus, you will be in the best position possible for a bright future.